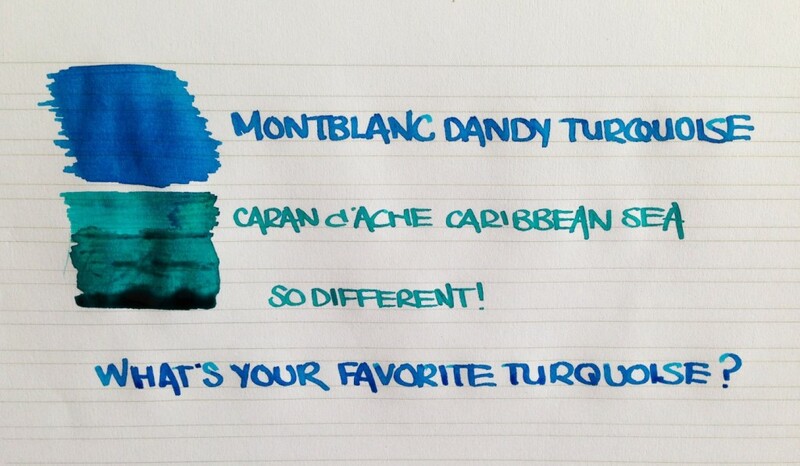 There’s such a range of turquoise inks, and I’m not sure if they’re all accurate in their naming system. I don’t really care, because they’re pretty. They also look very different when used with different nibs. This entry was posted in Ink and tagged Caran d'Ache, Montblanc. Bookmark the permalink. Follow any comments here with the RSS feed for this post. Post a comment or leave a trackback: Trackback URL. Definitely Pelikan 4001 turquoise. Bright and lively, a touch on the blue side of the balance, but an entirely cheerful turquoise.